For my reward booking, I earned the most of miles with my Citi ThankYou Premier Card. The 3X points on travel really helped along with the 2X on restaurants and entertainment. I also used some Chase Ultimate Rewards points from wife’s Chase Sapphire Preferred credit card. I then transferred the points from my Citi ThankYou account and my wife’s Chase Ultimate Rewards to my Singapore Airlines KrisFlyer account. You can transfer points from your wife’s account into your own. There are some restrictions but if your married you shouldnâ€™t have a problem. I will be posting a How-To on how to transfer points from someone else’s account into your own. I will have to transfer points from my wife’s account at some point later this year for another redemption I will be making. Stay tuned. It took about two days for the points to be transferred into my KrisFlyer account. Once the points were in my account, I was ready to book. Luckily when I booked, the flight I needed was not on the wait list. You can put yourself on the wait-list but its not guaranteed you will find a seat. I rather not be on a wait-list but if you have no choice, you can put yourself on the wait-list and hope your booking clears. 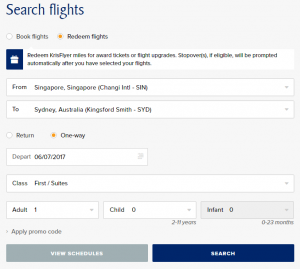 The flight from Singapore to Sydney cost me 63,750 KrisFlyer miles and $183 USD. Since I was booking 2 tickets, the total cost came out to 127,500 KrisFyler miles and $366 USD. This one-way ticket in First Class is going for $3,749! That means I only paid $366 in fees for $7,498 worth of travel! Once you select your flight, you will then get asked for your passport information. You will need this information to book. From there, you will go on to select your seats. 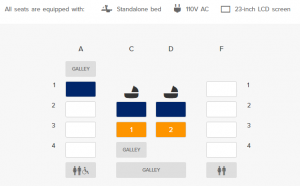 I was able to book the coveted seats of 3C and 3D which turn into a double bed! And that is it, you are booked for the Singapore Airlines A380 Suites! I hope this How-To-Guide really helped a lot of you. Please comment below and let me know if you have any additional questions or comments. Please check out my YouTube channel and all my other social media outlets. I will be flying the Singapore Airlines A380 Suites myself July 2017. Be on the look out for the video review of my experience.